The September 22 auction of 19th & 20th Century Prints & Drawings at Swann Galleries features a stunning array of nineteenth-century artworks. 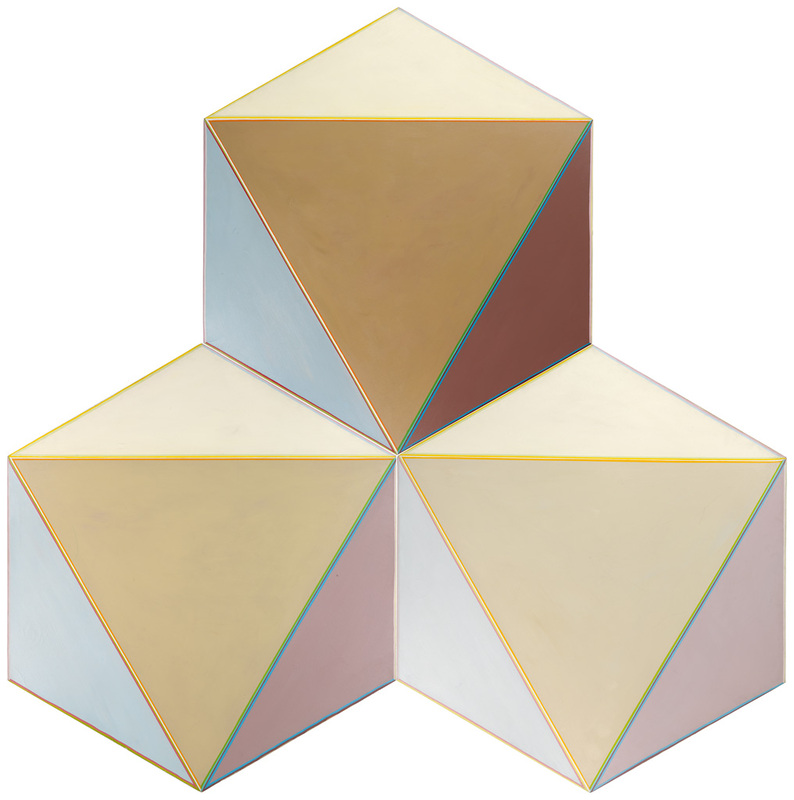 Such is the caliber of the selection that it is possible to trace the evolution of art history from the early nineteenth century to the dawn of the twentieth using only examples from the sale. 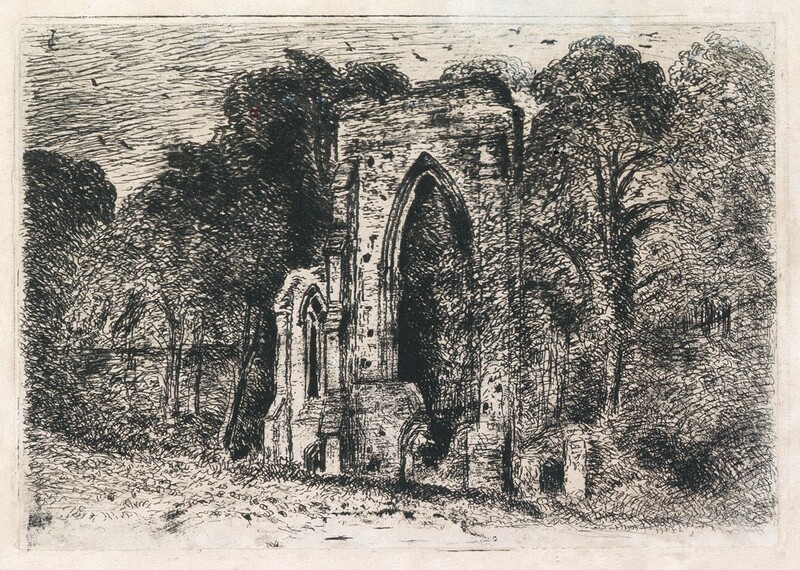 Lot 1: John Constable, The Ruins of Netley Abbey, etching and drypoint, circa 1825. Estimate $2,000 to $3,000. Ruins of Netley Abbey is an early example of John Constable’s compositions of ruined English abbeys. Only two impressions of this moody print have come to auction in the last 30 years. Lot 5: Honoré Daumier, Le Ventre Législatif, lithograph, 1834. Estimate $20,000 to $30,000. 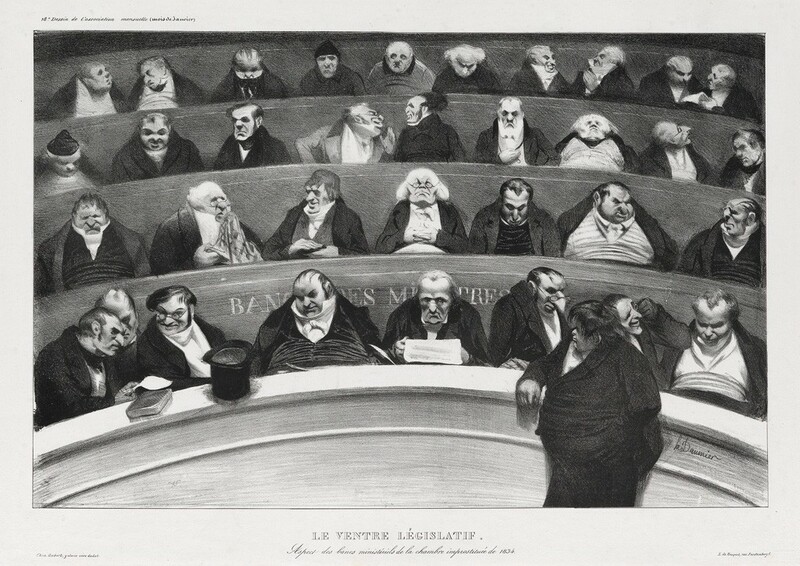 A run of political cartoons by Honoré Daumier prove surprisingly fresh. These scathing caricatures landed the artist in prison and gave the French working class a glimpse into the foibles of the bourgousie. La Ventre Législatif is a scarce, early work from the master, and the current impression is richly inked. 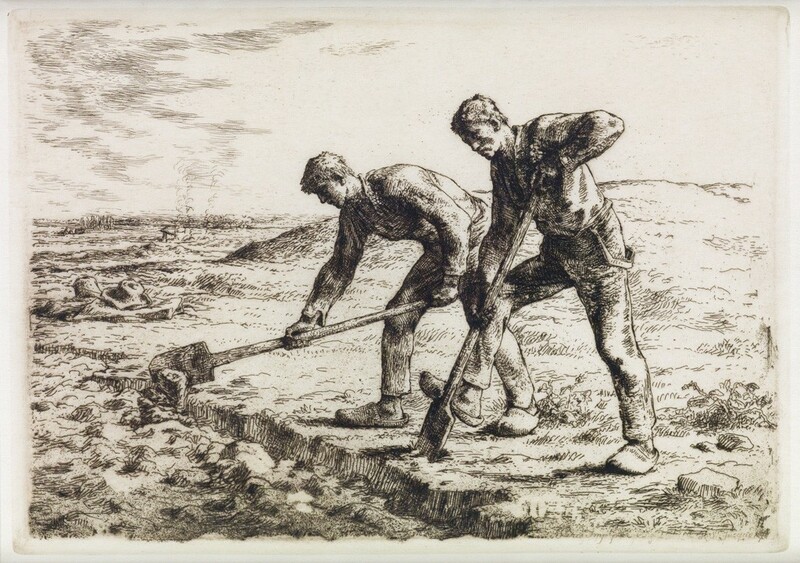 Lot 12: Jean-François Millet, Les Becheurs, etching, 1855-56. Estimate $2,000 to $3,000. Lot 14: Jean-Baptiste-Camille Corot, Environs de Rome, etching, 1866. Estimate $1,500 to $2,500. 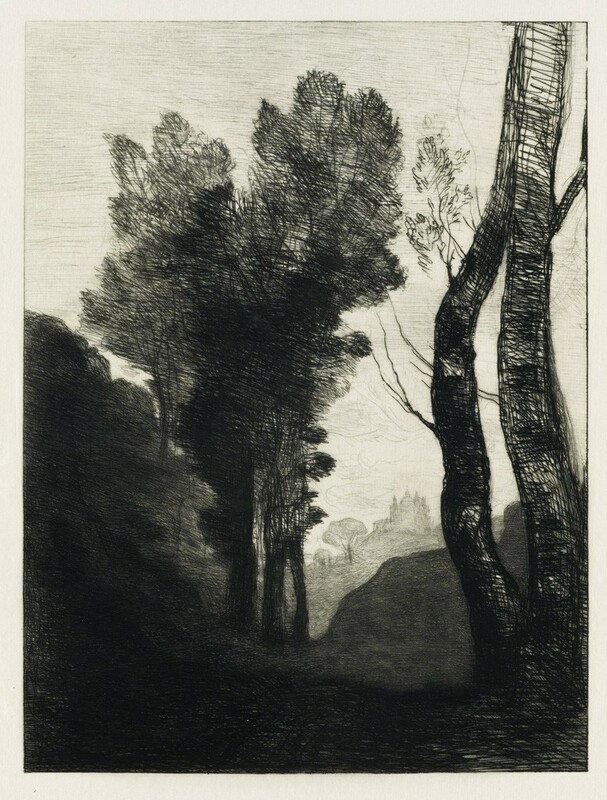 Etchings by Jean-François Millet and Jean-Baptiste-Camille Corot show a shift in French art towards the beginnings of Impressionism: works like Les Becheurs and Environs de Rome celebrate the lives of ordinary, hardworking people and the beauty of wild landscapes caught in a single moment in time. The current impression of Les Becheurs is a warm toned fourth state. Works by Corot, the mentor of Camille Pissarro, provide a direct link to the development of Impressionism in the 1870s. This highly detailed third state impression of Environs de Rome is an excellent example. Lot 36: James A.M. Whistler, Riva, No.2, etching, 1879-80. Estimated $10,000 to $15,000. We can see the parallel development of American tastes in a run of works by James A.M. Whistler. Riva, No. 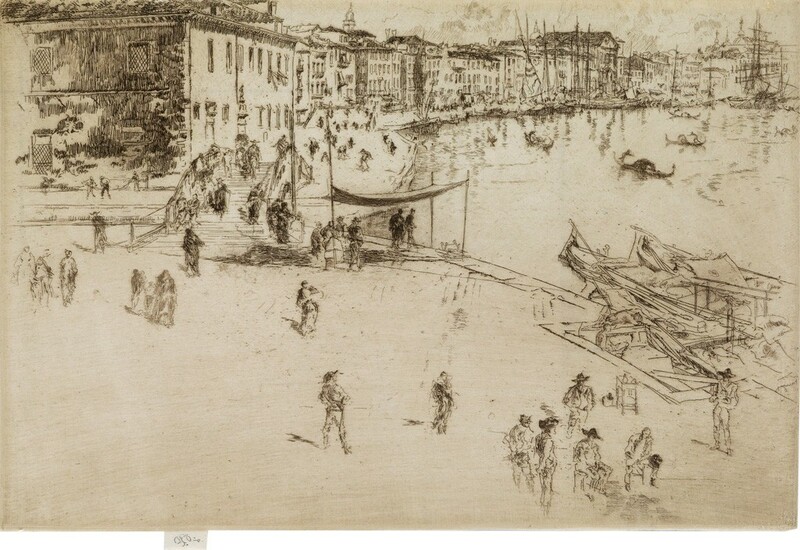 2 is one of the 12 etchings done on his 1879 trip to Venice commissioned by the Fine Art Society in London. This warm, detailed impression is the first of two states before cancellation; only approximately 30 were printed. 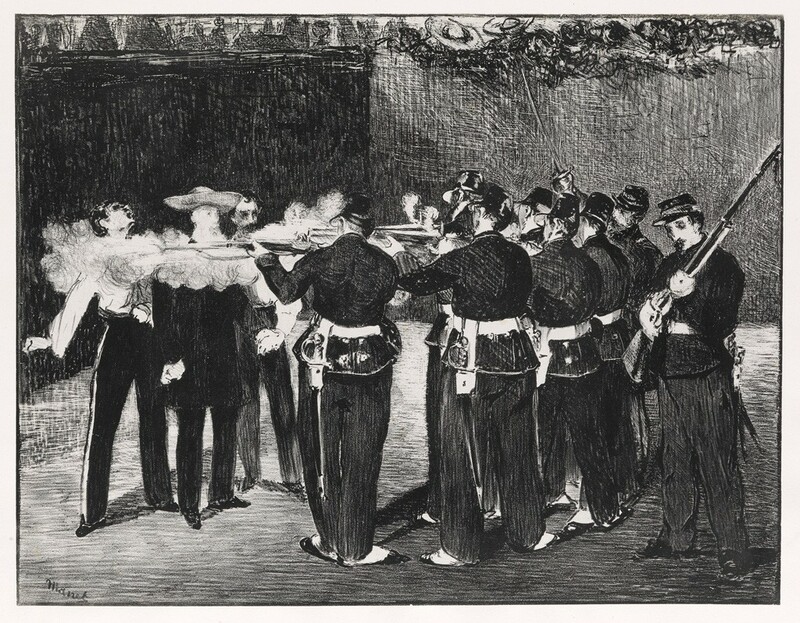 Lot 53: Edouard Manet, L’Exécution de Maximilien, lithograph, 1868. Estimate $50,000 to $80,000. A major rarity in the sale is a large lithograph by Edouard Manet showing L’Exécution de Maximilien, a favorite scene of the artist. Four other canvases depicting the scene are currently in the collections of museums around the world. The composition makes a direct reference to an earlier masterpiece; Francisco José de Goya’s 1814 oil painting The Third of May 1808, Museo del Prado, Madrid. 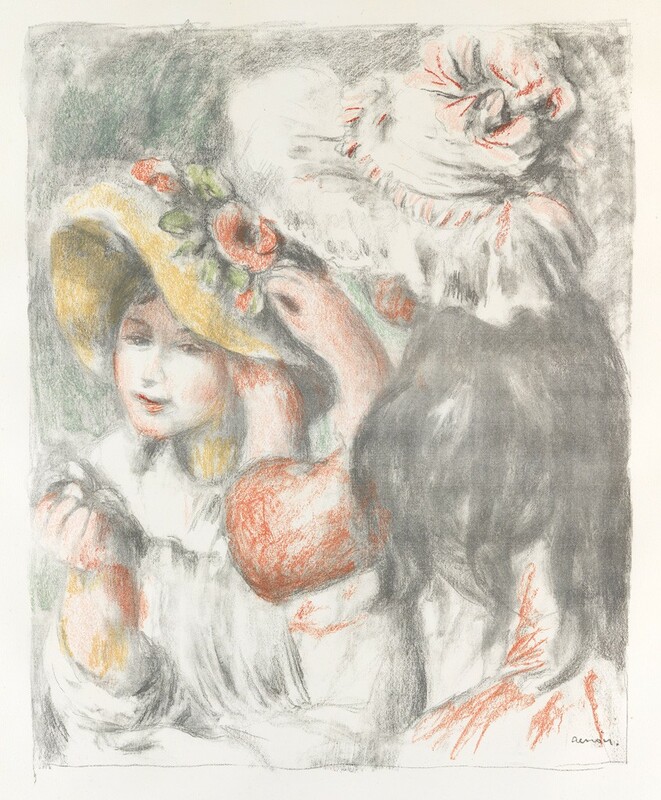 Lot 59: Pierre-August Renoir, Le Chapeau Épinglé (2e planche), color lithograph, 1898. Estimate $30,000 to $50,000. 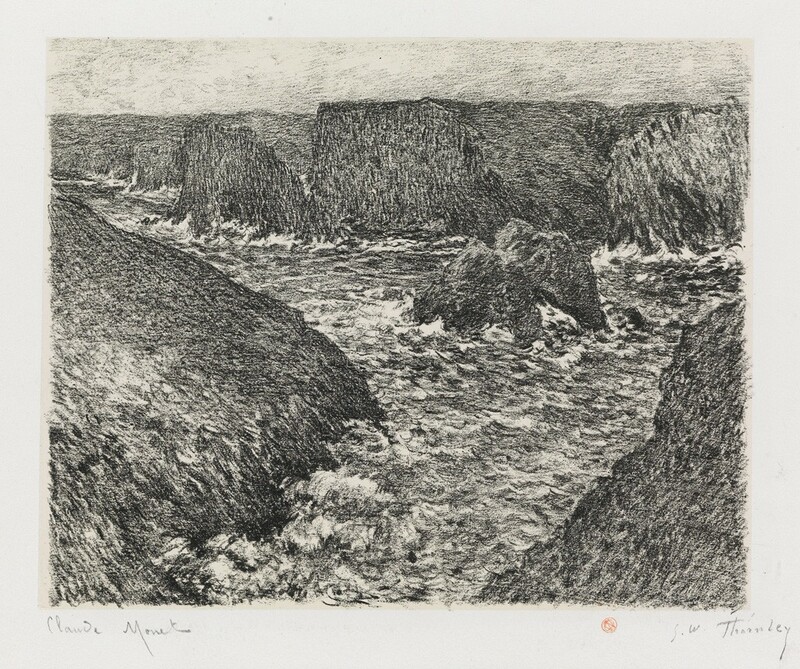 Lot 76: Claude Monet and George W. Thornley, La côte rocheuse, lithograph, before 1892. Estimate $15,000 to $20,000. Pierre-August Renoir brings us finally into Impressionism with his airy, blissful scenes reflecting the leisure activities of a growing working class. Dazzling works by Mary Cassatt, Edgar Degas and Berthe Morisot round out the sweet scenes of quotidian life, while a run of prints from a collaboration between Claude Monet and lithographer George W. Thornley are infused with the elusive and shimmering light of Monet’s iconic Impressionist oil paintings. 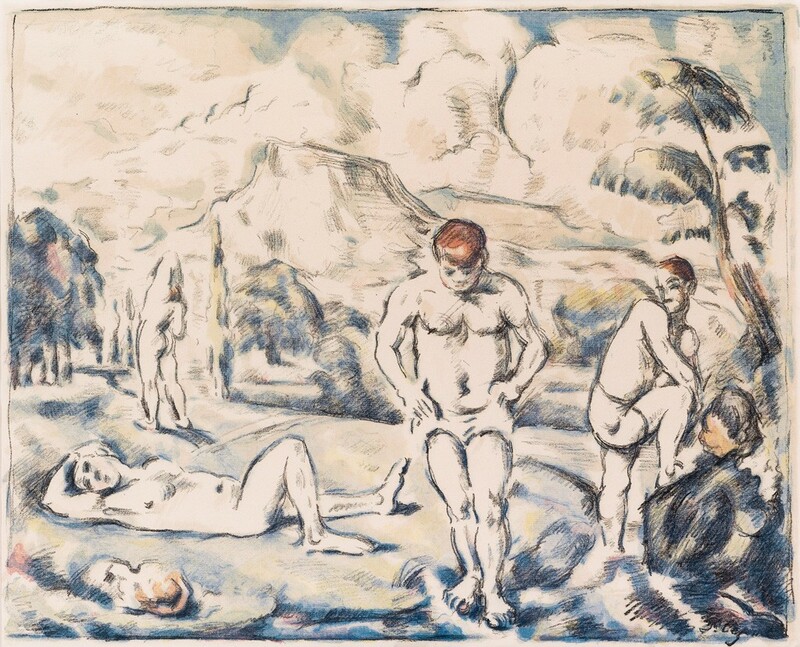 Lot 92: Paul Cézanne, Les Baigneurs (grande planche), color lithograph, 1896-98. Estimate $20,000 to $30,000. No sale offering Impressionist prints would be complete without works by pillars of the movement, Camille Pissarro and Paul Cézanne. Les Baigneurs is based on an earlier painting currently in the collection of the Barnes Foundation. The current large third state impression of this important lithograph is graced by exceptionally vivid blues. The sale continues into the twentieth century with dazzling works by Marc Chagall, Roy Lichtenstein, Joan Miró and Pablo Picasso. For more incredible works, check out the full catalogue.